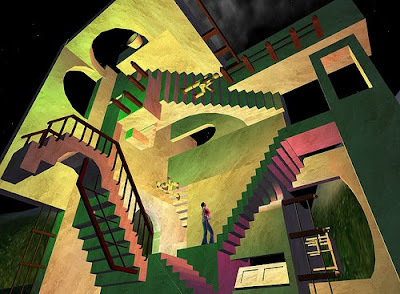 Not Possible IRL: Escher coming out of the pixelworks! Yesterday, I told you about Furia Freeloader's Escher Relativity House, and this morning, I discovered a comment to that post from none other than Torley, alerting me to this (teleport directly from here). Per Torley, "It used to be in Uli, then I recall it moving to Serenite." Keith Extraordinaire (rez: 7/8/2004) built it in July of 2004, which also happens to be the same month he rezzed! I attempted to contact Keith, but he was not in-world. I had to smile when I read his profile, though: "I love to build and love to explore what folks have made in SL. There is nothing like walking through another’s creativity, and for me that is what SL is about. One of the things I enjoy most is getting totally lost in another’s imaginative dream." I guess when you've been in Second Life almost four years, you give up trying to showcase your highlights in your profile picks. Instead, this generous man focuses on pointing others to the work of people he admires, including Lumiere Noir's Ivory Tower of Primitives (teleport directly from here). "SL Date 7/4/2004 A noob is born into SL with wide eyed amazement at all he sees. I started on one wall, baby steps lol... At this time I didn't know about shift and drag copying, nor that one could sit down to avoid push guns in the sandbox, but I dredged on and soon one wall section was done. After class, Lumi invited us over to see his little pet project still under construction, The Ivory Tower. He was still building it and adding the tutorials but what he had done I devoured and quickly ran back to the sandbox with my new knowledge. Soon my first build was done, MC Escher's Relativity in Prims, same as it stands before you today. I could go in and trim a few prims here and there, get rid on the flicker, but eh, It's my bit of SL history, so I leave it be and remember those early days being shot out of Cordova and faceplanting two sims away. The build has moved with me as I have moved in SL and now lives on my island sim, Serenite. Doncha love Second Life and the people who make it this incredible? Yes I saw this in my early days in SL. It remember it looking nicer than the newer one but it doesn't have poseballs.